Celebrate your child's Christening with a bespoke cake from Fancy Cakes by Rachel. We make Bible cakes, Cross cakes, Carousel cakes and cakes with blocks which spell out your baby's name, teddy bears, rattles and bootees or we can put a sugar model of your child's favourite soft toy on the cake. Let us know what design you would like for your cake and we will create it for you. You can see some of our designs in the cake gallery. All of our cakes are baked fresh to order using the best quality ingredients. You can choose from a range of different flavours, please look at the cake flavours page to see our full range of cakes. 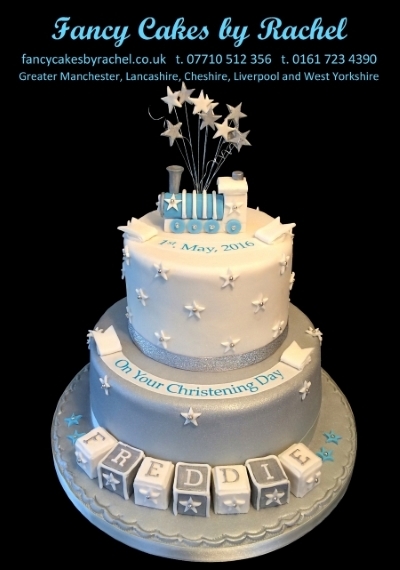 The most popular flavours for Christening cakes are the vanilla madeira cake with jam and buttercream filling and the chocolate cake, made with real chocolate. Red velvet with a creamy buttercream filling is an increasingly popular choice of cake flavour. If you would like to contact us using the contact form on the contact page please include a description of the design you would like and also the number of people the cake is for and we will let you know the price for your cake. All cakes are prepared in an environment where nuts, gluten, eggs and dairy are used. Therefore we cannot gaurantee nut, gluten, egg and dairy free.